This pink pineapple quilt has been a lot of fun to work on! I started by working out of the scrap basket, but I had to supplement with the stash. (It's all good! I'm actually USING my fabric. Hurray!) I looked back at my photos to discover that I made the first block at the end of June. Funny, it doesn't seem like it was that long ago! The blocks will finish at 8". 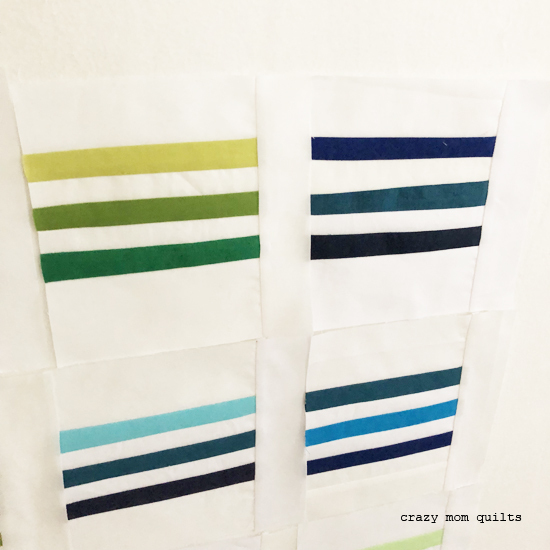 I'm using the creative grids pineapple trim tool. (I'm pretty sure that the ruler is smarter than I am!) 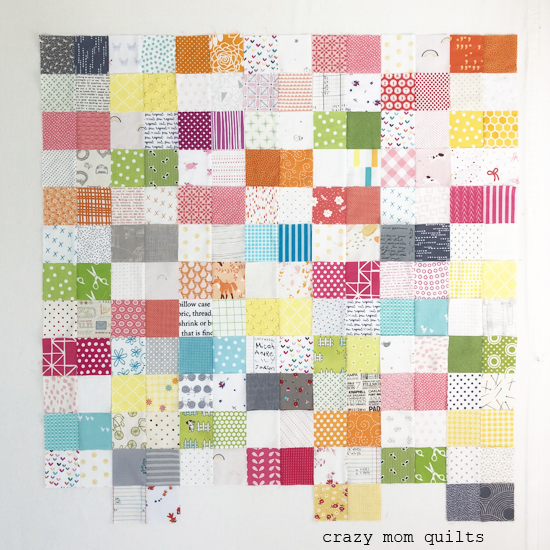 I am planning on making 20 blocks for a baby quilt. The recipient is already 7 months old, so I'd better get moving on it before I have to make it a twin size. Hahahaha! 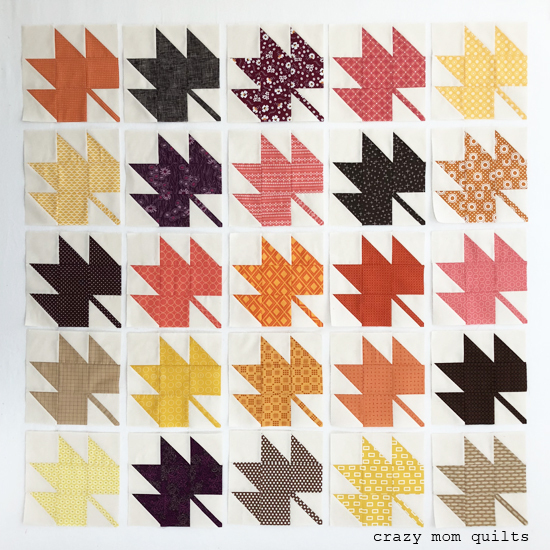 I had the very beginnings of this quilt on my design wall for months and months. 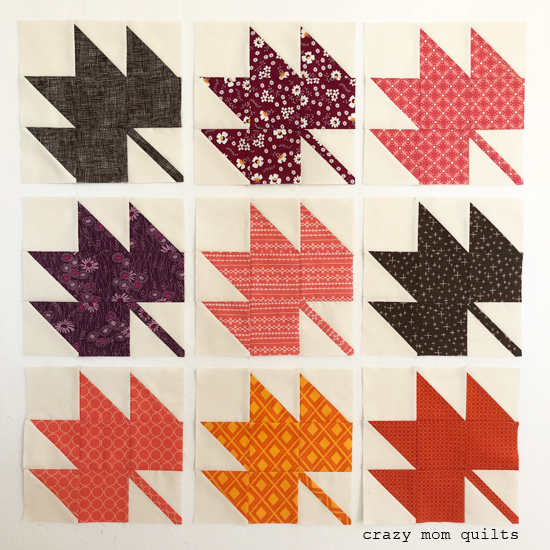 Last week when I moved the blocks to make room for more maple leaves, I decided that I might as well start sewing them together as I moved them to the side. I added several more pairs of squares and now I have YET ANOTHER work in progress. It's all good, though! 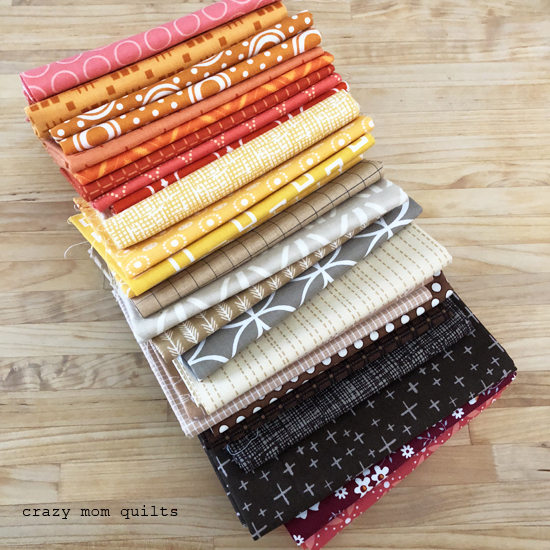 I'm using my robust stash of 2 1/2" squares that I have been cutting along the way for a "someday" project. I'm calling this one "two step". It's just as simple as can be, but I already love it so. 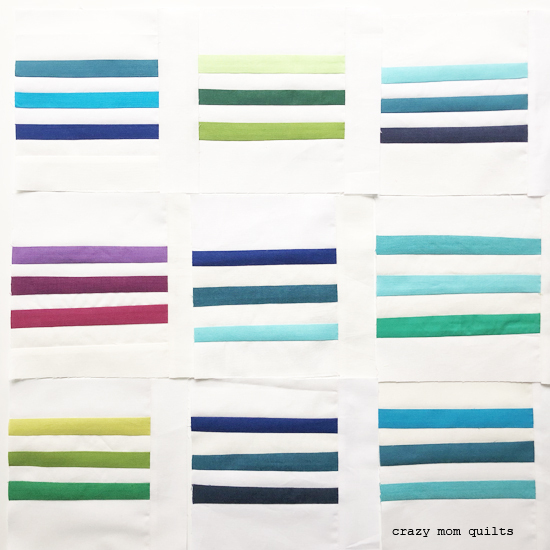 Simple scrappy quilts are my all time favorite! I'm almost there on my magnificent maples! I'm so excited that there are only a few more blocks to make. I'm also VERY excited that the layout is already determined. That will save me a lot of time when it comes to assembly. Hurrah! I plan to do very thin sashing to allow the leaves to have room to breathe, and I might add a wider border to it. We'll see how it shapes up. I am still LOVING this color palette. 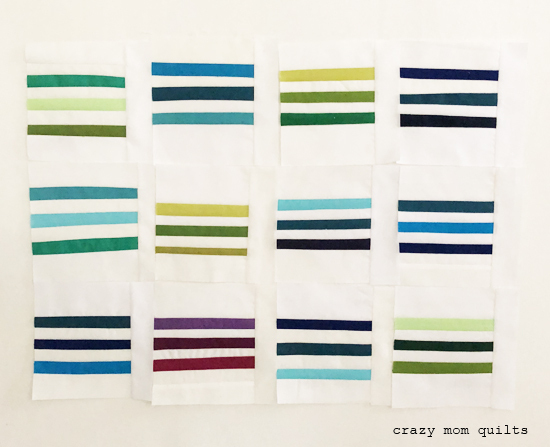 I started a new quilt last week. I've had the fabric pulled for well over a year--background fabric and everything. 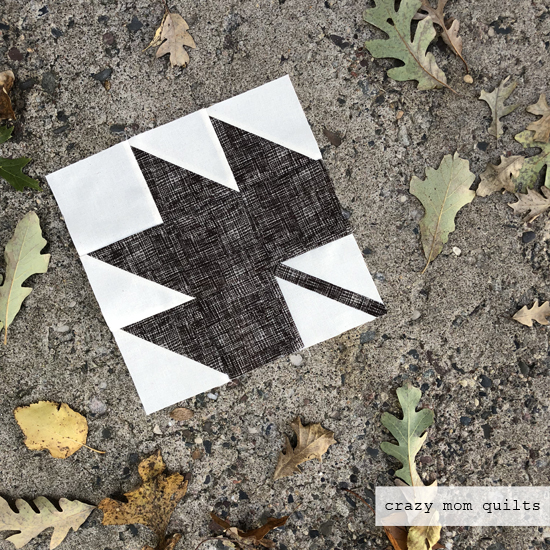 Last Tuesday was a BEAUTIFUL fall day, so I celebrated by whipping up this fun and easy maple leaf block, even though I only had 20 minutes to sew. It was time well spent! 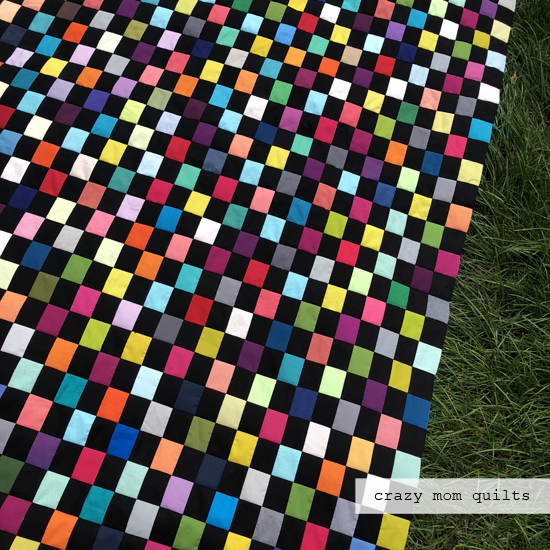 I'm SO EXCITED for this quilt! I'm having a blast making the blocks and I am SMITTEN with this color scheme. I love that most of the fabrics are blenders, with a few louder (but not too loud) prints. As of this afternoon, I have 25 blocks complete. I'm using Kona Natural for the background and each block will finish at 9". Here is my original fabric pull. I've already edited out at least 7 fabrics and I've added that many more into the mix. I think it's funny how much my fabric decisions change once I get started. 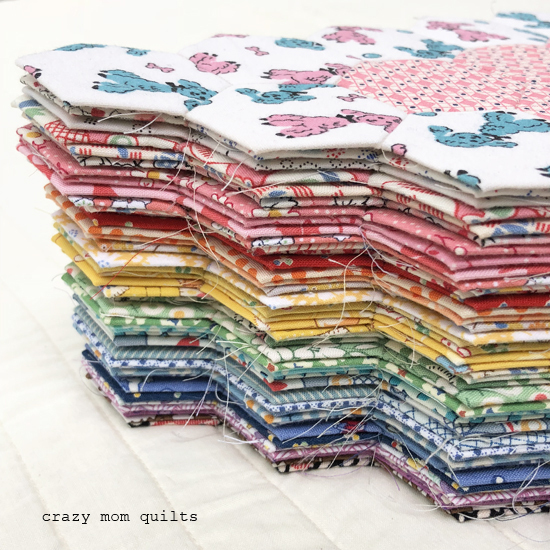 I've learned a long time ago that is usually the case, so I only cut a few blocks at a time to avoid chopping up a bunch of fabric that I won't actually use in the quilt. 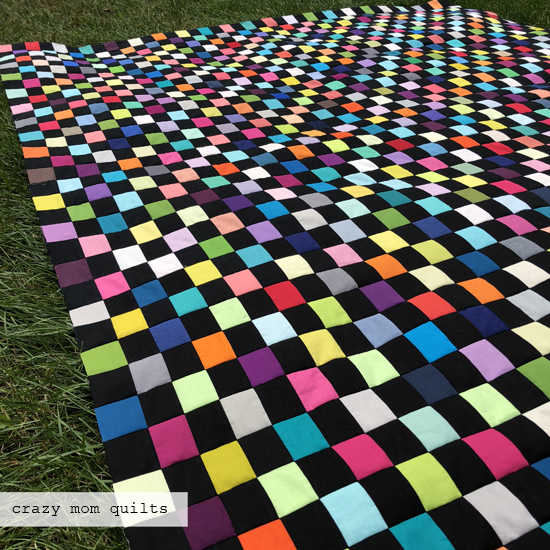 I finished my black licorice quilt top! I worked on it quite a bit over the weekend and I was delighted to discover this morning that I only had 2 seams left to complete it. What a way to start a Monday! Each piece finishes at 1 1/2" x 2". There are 42 blocks in each row and 37 rows, for a total of 1,554 pieces!!!! It's a good thing I did the math AFTER the quilt top was complete rather than before, otherwise that might have been a little daunting. Ha! I think it's tricky to find that fine line of being out of your comfort zone, but still liking the results. 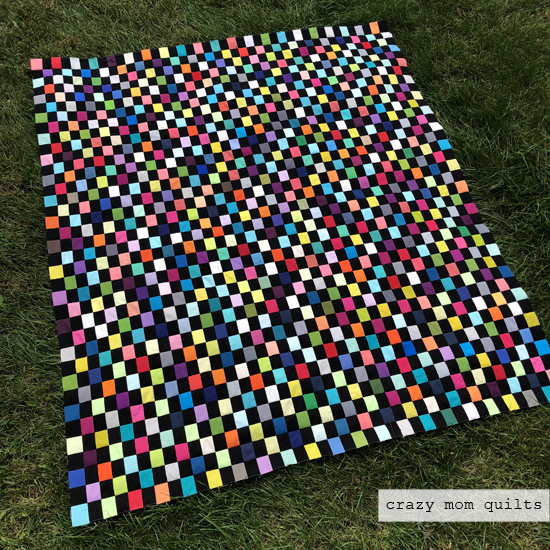 I feel like I was able to accomplish that with this quilt and I'm so thankful! 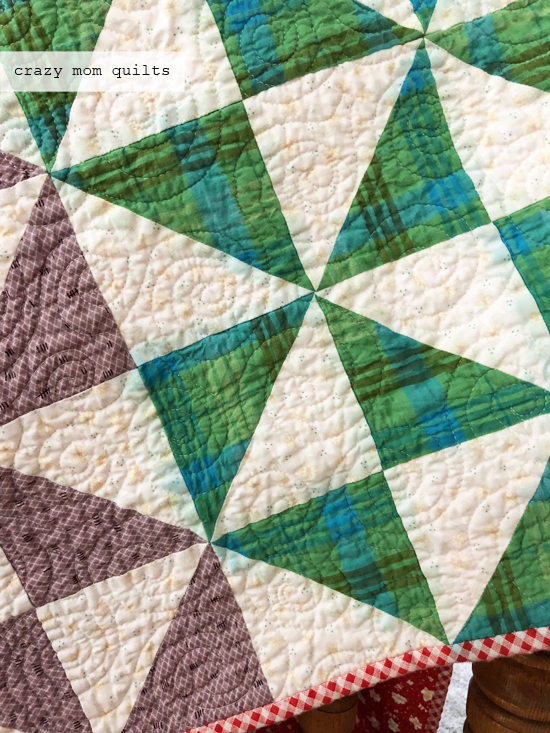 This quilt is part of my "Salute to Solids" series. I have plans to give it to my daughter when it's complete. She's pretty excited about it! I've been resisting starting a new project for the past several weeks. After a lovely trip down to Iowa for teaching last weekend (and 500 miles of time to think), I cracked. I HAD to start something new or I was afraid I would explode. SO many ideas. SO little time. I know, it's a great problem to have. I wouldn't have it any other way. I'm calling this one "etc." All the solids are from the scrap bins so far. The strips measure about 1" finished and the blocks are about 6" unfinished. I'm excited to see where this goes. It's always an adventure! 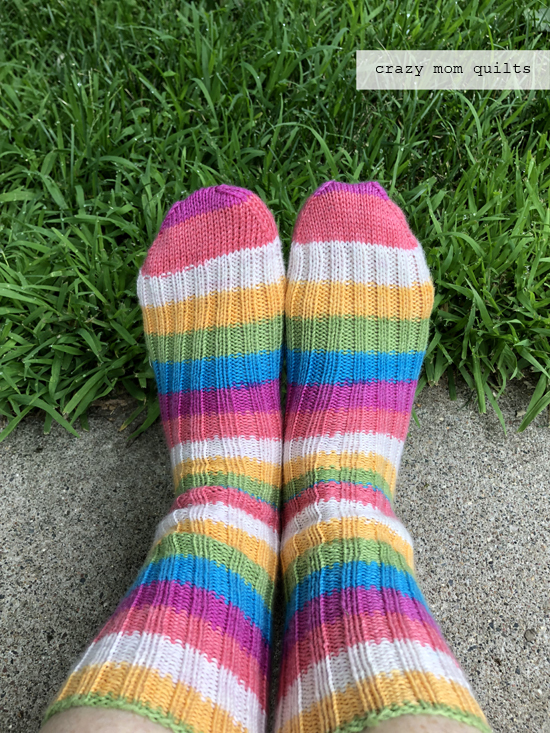 I finished this pair of socks (my 24th pair) back in August. 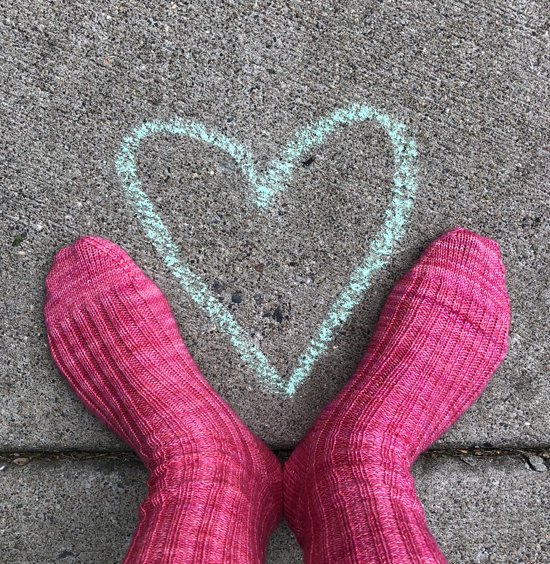 The yarn is Felici by Knit Picks, which was gifted to me by my sweet friend Suzanne. (I tried to find a link to the yarn, but I think it's either out of stock or discontinued.) I'm pleased as punch with this pair as well! 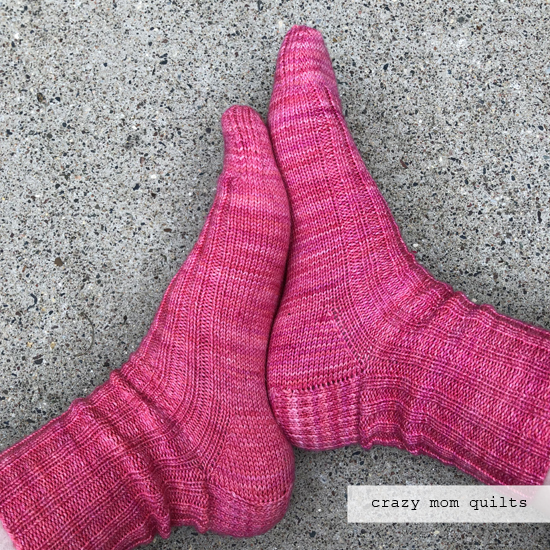 I used my basic sock pattern (available here) for both of the pairs shown. Now, it's your turn! Please link up your finishes for the MONTH....if you have multiple finishes to share, please feel free to link up more than one! Thank you, as always, for joining me for finish it up Friday! I know that some of you miss having a weekly link up, but I have to say, that doing it once a month has been so helpful for my sanity. (I don't have that much to spare. hahaha!) Anyway, I hope you have a FABULOUS weekend! 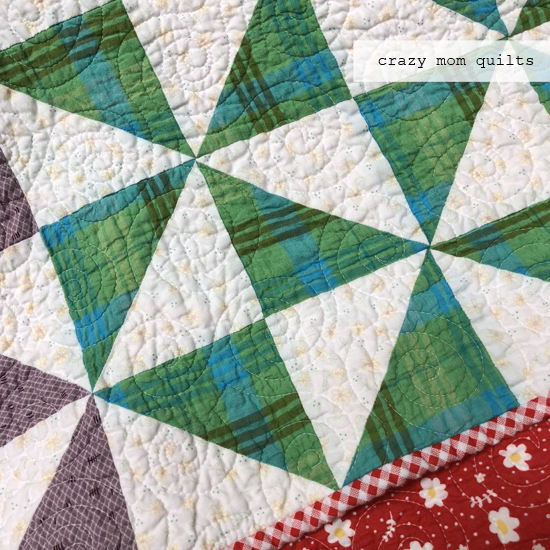 I don't often wash my quilts right after they are finished, but as I mentioned last week, I washed and dried my broken dishes quilt to get that lovely crinkle. I got the crinkle I was after, but I also discovered that the turquoise dye in one of the quilt blocks bled quite a lot. Ugh. 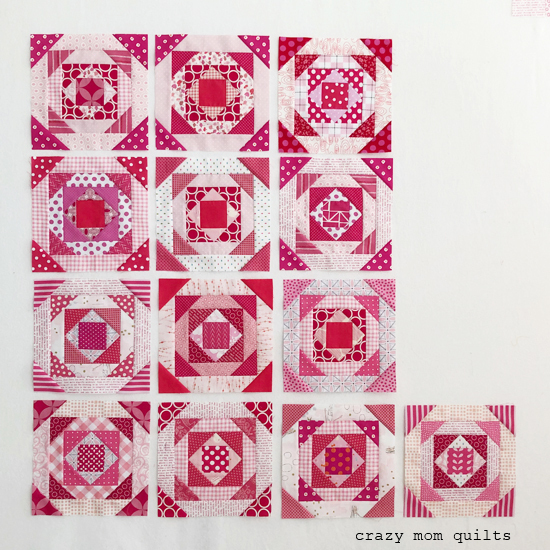 There is a lot of red in the quilt, so I thought that it would be one of the red fabrics that would give me trouble. Nope. I discovered the issue AFTER I had dried the quilt in the drier. Blergh. I shared a photo with my friend Mary, and she recommended using this method to try to remove the excess dye. I was doubtful that it would help, but I thought I might as well give it a try. At this point, what did I have to lose? I followed Vicki's instructions, using "All Free and Clear" detergent. I'm very pleased to share that a LOT of the excess dye came out. Woohoo! Thanks so much to Vicki for sharing her methods and Mary for pointing me in the right direction! I thought I would pass along this information, just in case you are in the same position someday. I hope you find it helpful, too! 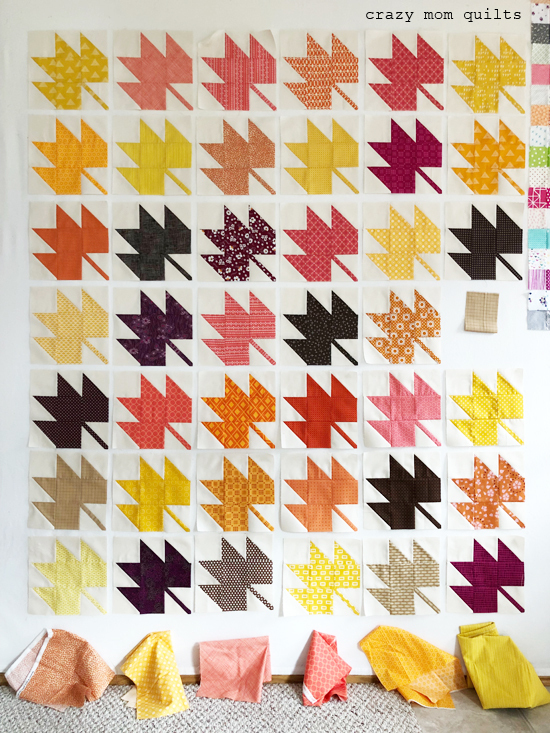 I took some time today to lay out the blocks and see how the colors are playing together. So far, I'm very pleased!!! Looking at this photo, I see that I need to add a lot more green. The background joining pieces will be red-orange, just like the centers of each block, although I really like how they look on the cream background in this photo. My goal is to make 110 blocks, so if my math is correct, I'm nearly 41% done. Not too bad! 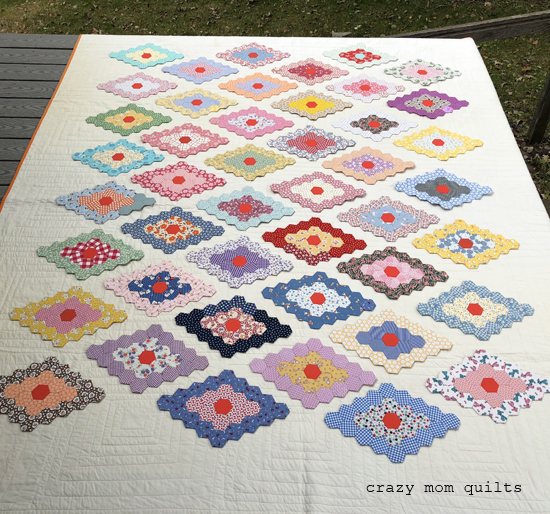 The antique quilt that inspired this project can be seen here.